Connecting computation to experiment is at the heart of physics. This set of exercises requires students to create a computational model for a ball launched into the air to determine the distance traveled and total time in the air. The students then must perform the experiment by launching the ball with a spring launcher. Data from the experiment must be entered into the computational model and the experimental results are compared to the computer model. Before you proceed with this part of the exercise make a prediction of how the time the ball takes to hit the floor varies as you increase the initial speed for the case of the ball being launched horizontally. Do you think the ball will be in the air longer, the same, or a smaller time than the initial launch speed? Make another prediction about how the total horizontal distance the ball travels before hitting the ground as you increase the initial launch speed of the horizontally launched ball. Do you think the horizontal distance will increase, remain the same, or decrease as you increase the initial speed. Once you’ve made your prediction, run your model with five different initial speeds and record the total horizontal distance and the total time the ball is in the air. Create two graphs from this data, one for horizontal distance vs. initial launch velocity and another graph for total air time vs. initial launch velocity. How do your predictions compare to the output from the computational model? If your predictions differed from the model results explain how your thoughts have changed as a result of viewing the model. Make your predictions before running the computer model. If you set the launcher to shoot the ball straight up in the air (set θ=90∘θstyle="padding-top: 0px; padding-right: 0px; padding-bottom: 0px; padding-left: 0px; border-top-style: none; border-top-width: 0px; border-right-style: none; border-right-width: 0px; border-bottom-style: none; border-bottom-width: 0px; border-left-style: none; border-left-width: 0px; display: inline; margin-top: 0px; margin-right: 0px; margin-bottom: 0px; margin-left: 0px; line-height: normal">=style="padding-top: 0px; padding-right: 0px; padding-bottom: 0px; padding-left: 0px; border-top-style: none; border-top-width: 0px; border-right-style: none; border-right-width: 0px; border-bottom-style: none; border-bottom-width: 0px; border-left-style: none; border-left-width: 0px; display: inline; margin-top: 0px; margin-right: 0px; margin-bottom: 0px; margin-left: 0px; line-height: normal">90style="padding-top: 0px; padding-right: 0px; padding-bottom: 0px; padding-left: 0px; border-top-style: none; border-top-width: 0px; border-right-style: none; border-right-width: 0px; border-bottom-style: none; border-bottom-width: 0px; border-left-style: none; border-left-width: 0px; display: inline; margin-top: 0px; margin-right: 0px; margin-bottom: 0px; margin-left: 0px; line-height: normal">∘style="padding-top: 0px; padding-right: 0px; padding-bottom: 0px; padding-left: 0px; border-top-style: none; border-top-width: 0px; border-right-style: none; border-right-width: 0px; border-bottom-style: none; border-bottom-width: 0px; border-left-style: none; border-left-width: 0px; display: inline; margin-top: 0px; margin-right: 0px; margin-bottom: 0px; margin-left: 0px; line-height: normal">style="padding-top: 0px; padding-right: 0px; padding-bottom: 0px; padding-left: 0px; border-top-style: none; border-top-width: 0px; border-right-style: none; border-right-width: 0px; border-bottom-style: none; border-bottom-width: 0px; border-left-style: none; border-left-width: 0px; display: inline; margin-top: 0px; margin-right: 0px; margin-bottom: 0px; margin-left: 0px; line-height: normal">style="padding-top: 0px; padding-right: 0px; padding-bottom: 0px; padding-left: 0px; border-top-style: none; border-top-width: 0px; border-right-style: none; border-right-width: 0px; border-bottom-style: none; border-bottom-width: 0px; border-left-style: none; border-left-width: 0px; display: inline; margin-top: 0px; margin-right: 0px; margin-bottom: 0px; margin-left: 0px; line-height: normal">style="padding-top: 0px; padding-right: 0px; padding-bottom: 0px; padding-left: 0px; border-top-style: none; border-top-width: 0px; border-right-style: none; border-right-width: 0px; border-bottom-style: none; border-bottom-width: 0px; border-left-style: none; border-left-width: 0px; display: inline; margin-top: 0px; margin-right: 0px; margin-bottom: 0px; margin-left: 0px; line-height: normal">), predict how the time the ball remains in the air varies as you increase the initial speed. Will the time in the air increase, remain the same, or decrease as you increase the initial speed? Set the launch angle to 90∘90style="padding-top: 0px; padding-right: 0px; padding-bottom: 0px; padding-left: 0px; border-top-style: none; border-top-width: 0px; border-right-style: none; border-right-width: 0px; border-bottom-style: none; border-bottom-width: 0px; border-left-style: none; border-left-width: 0px; display: inline; margin-top: 0px; margin-right: 0px; margin-bottom: 0px; margin-left: 0px; line-height: normal">∘style="padding-top: 0px; padding-right: 0px; padding-bottom: 0px; padding-left: 0px; border-top-style: none; border-top-width: 0px; border-right-style: none; border-right-width: 0px; border-bottom-style: none; border-bottom-width: 0px; border-left-style: none; border-left-width: 0px; display: inline; margin-top: 0px; margin-right: 0px; margin-bottom: 0px; margin-left: 0px; line-height: normal">style="padding-top: 0px; padding-right: 0px; padding-bottom: 0px; padding-left: 0px; border-top-style: none; border-top-width: 0px; border-right-style: none; border-right-width: 0px; border-bottom-style: none; border-bottom-width: 0px; border-left-style: none; border-left-width: 0px; display: inline; margin-top: 0px; margin-right: 0px; margin-bottom: 0px; margin-left: 0px; line-height: normal">style="padding-top: 0px; padding-right: 0px; padding-bottom: 0px; padding-left: 0px; border-top-style: none; border-top-width: 0px; border-right-style: none; border-right-width: 0px; border-bottom-style: none; border-bottom-width: 0px; border-left-style: none; border-left-width: 0px; display: inline; margin-top: 0px; margin-right: 0px; margin-bottom: 0px; margin-left: 0px; line-height: normal">style="padding-top: 0px; padding-right: 0px; padding-bottom: 0px; padding-left: 0px; border-top-style: none; border-top-width: 0px; border-right-style: none; border-right-width: 0px; border-bottom-style: none; border-bottom-width: 0px; border-left-style: none; border-left-width: 0px; display: inline; margin-top: 0px; margin-right: 0px; margin-bottom: 0px; margin-left: 0px; line-height: normal"> in your computational model and launch the ball with at least five different initial speeds. Record the total time in the air. Plot time in the air vs. initial speed. Explain why we don’t need to plot the horizontal distance vs. time graph for this exercise. How does your prediction compare to the results of the computational model? If your prediction differed from the model explain how your thoughts have changed as a result of viewing the model. 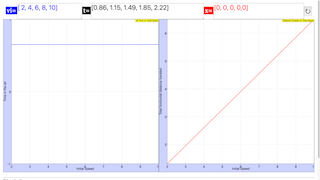 http://archive.geogebra.org/en/upload/files/english/lewws/basketballsimulation_counterspeed_simulationspeed_updated1r.html Simulation of BasketBall Throw by Lew W. S.